Martha Washington geraniums, also known as regal geraniums, are vibrant flowers ideal for the indoors, where a temperate climate will maintain the blossoms. Martha Washington geraniums bloom in the summer, revealing pink, red and white blossoms. The geraniums need sunlight and a regular schedule of water and fertilizer to thrive. Decide where to plant your Martha Washington geraniums. The best place is near a window indoors where they would receive the most sunlight. The geranium thrives when it gets at least six hours of daily sunlight in a spot that has an average temperature of 65 degrees during the day and 55 degrees at night. A garden bed, planter or hanging basket outdoors will work fine in these conditions. Pick a well-made pot with drainage holes in the bottom. Rather than setting the pot on a saucer, use a surface that allows full drainage when you water the plant. 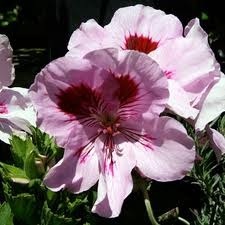 Fill your pot with mildly acidic soil (ideally a pH of 6.5) to improve your geranium’s growth. Use an indoor fertilizer on the soil every two weeks during the flower’s bloom. Fertilize about once a month during fall and winter when the flower isn’t blooming. Water the plant weekly and mulch the area twice a month. Plant geraniums 12 to 24 inches apart. Don’t put them in areas of the home that might harm them, such as near a heating vent or next to a window that is opened often. 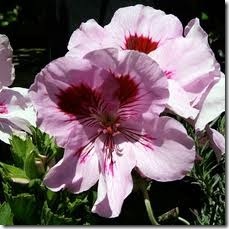 To keep your geraniums looking their best, remove any wilting or dried leaves, stems or flowers. Be aware of any signs of pests or diseases. Some common diseases show up in graying and moldy leaves or blackened stems. Treat the diseases by removing infected leaves or stems. Infections from pests such as caterpillars, aphids and termites usually result in yellow stems. Treat them with a chemical spray specific to the pest.